I'm also posting a couple of pictures from today. 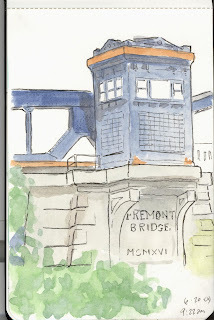 The NW tower of the Freemont Bridge, which may be housing their artist in residence (?) viewed during my STP training ride this morning. The Burke Gilman trail has lots of great subjects from people to buildings to feral chickens in Bothell. Though I don't recommend standing and drawing after riding 30 miles as I did for this sketch! 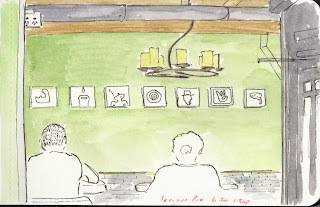 The second sketch is of the back corner of Serious Pie, a great pizza joint downtown. Sadly I sat on the wrong side of the table, with back to the cook and stove. But the pictures on the wall were too intriguing to pass up. The food came too fast to finish up the picture this time. welcome Dave, i can't imagine you had energy left for anything after a 30 mile ride! Thanks. Even harder is getting back on the bike to ride the 30 miles home after standing still sketching! And thanks for adding the title--I did see a bunch of Solstice parade goers but I'm not fast enough to sketch them as the whipped by on their bikes.